December will probably end up being one of the better sales moths for cars this year which, about 20 years ago, would have sounded like utter nonsense. December has one less selling week than most months. People are spending money on presents. It's often cold. What happened? Freakin' Lexus man. Freakin' Lexus. In 2000 and 2001, December was just the 10th-best month of the year (January is almost always last), but a shift was afoot. 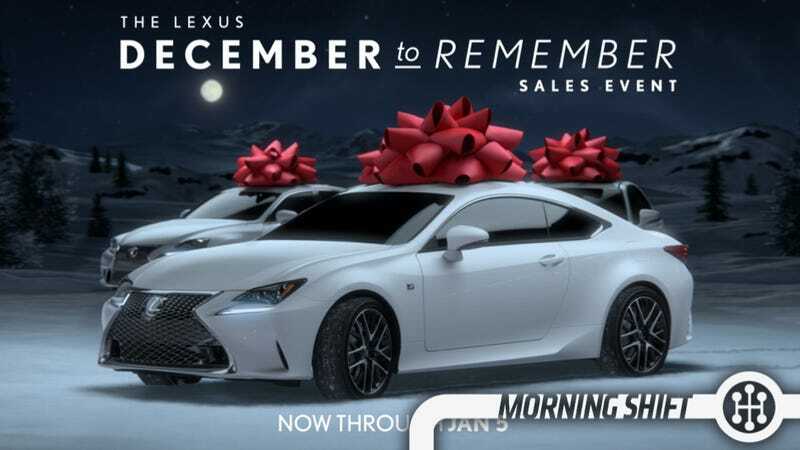 Lexus had started its "December to Remember" ad campaign in 1998, and it got noticed. By 2000, Lexus had passed Mercedes-Benz to become the industry's top-selling luxury brand, and its December bonanza was a big reason why: Lexus was regularly selling more cars in December than any other month. Mercedes and BMW then began year-end events of their own, and the volume brands soon followed. The idea of giving a car as a Christmas gift went from being an ad agency conceit to a regular occurrence: Plenty of dealers started delivering cars with big red bows on top. Now, the whole industry tends to gear up for big December sales events, said John Mendel, executive vice president of sales for American Honda. "December is going to be really strong for us," Mendel said. These days, "there are two months you can always count on: One is August and the other is December," he added. If they can beat 1.5 million sales this month the auto industry will have its second best December ever. While the misery of perpetual conflict in post-Qaddaffi Libya is a human rights crisis at a terrible scale, it's been great for producers of oil who have seen months of crashing prices cut into their bottom lines. Brent futures rose 1.1 percent in London. Fires have been extinguished at three of six tanks at Es Sider, Libya’s largest oil port, which were set ablaze after an attack by militants, said National Oil Corp. spokesman Mohamed Elharari. Algerian Energy Minister Youcef Yousfi called on the Organization of Petroleum Exporting Countries to cut output to boost prices, the Associated Press reported. Oil plunged 46 percent this year, set for the biggest annual drop since 2008, as OPEC resisted supply cuts to defend market share in response to the highest U.S. production in three decades. Libya pumped 580,000 barrels a day in November, down from about 1.59 million at the end of 2010, according to data compiled by Bloomberg. Trading was below average amid Christmas and New Year holidays. Much of the talk back in Houston was of people who knew people who lost their jobs at energy companies, although I don't know how widespread the cuts were. Audi is, arguably, Volkswagen's strongest brand. Sure, Porsche has grown a lot, and Volkswagen is always going to be the biggest seller, but Audi has managed to both grow and become a huge percentage of the company's profits and portfolio. It should be no surprise then, that the WSJ is reporting that Audi is upping their investment from a planned $26.9 billion to $29.3 billion. Hey, invest in what works, right? About 70%, or roughly €17 billion, of Audi’s investments will go into new models and technologies such as new combustion engines needed to meet CO2 limits world-wide, fuel-efficient gasoline and diesel engines and plug-in hybrid cars, the company said. It also will invest in improving vehicle connectivity and driver assistance and in expanding Audi’s world-wide plant network. I'd do roughly the same if I was running Audi, though I'd perhaps set aside a few bucks to crash test the Audi Avants in the U.S. Just saying. Chrysler's F-150 is the minivan. That's what Ralph Gilles once said and it stuck with me. That's the big vehicle they sell in a market they helped to invent and have always owned a large portion of. They're going to be building the new vehicle in the Windsor Assembly Plant, which is seeing the first construction this month as part of a long rollout to the new vehicle. There was a great article in The Detroit News this weekend that makes a fantastic point (well, Mark Reuss makes the point) about our current recall system. Specifically, they point out that a car that bursts into flames if you touch the steering wheel in the wrong way gets exactly the same recall as a vehicle that has a safety label that wasn't glued on properly. "A recall's a recall, and that's a problem," said Mark Reuss, GM's head of global product development, purchasing and supply chain, on the sidelines last month at the Los Angeles Auto Show. "There needs to be a sophistication of how serious is the recall? And that has to be really clear to a customer. I think the industry is beginning to do that." The issue is that we're not seeing everyone get vehicles repaired when they should. But what do you do? Is there a color coded system? Do we make people clear all recalls before they can register their vehicles? No one agrees. Reverse: Remember When People Drove Saabs? On this day in 1989, 20-year-old actor Christian Slater is arrested for drunk driving in Los Angeles, California. He had a blood-alcohol level of .24, or .24 grams of alcohol per 100 milliliters of blood—three times the legal limit in California. Slater's arrest came after a predawn car chase—he was driving 50 MPH in a 35-MPH zone—that ended when he crashed his Saab into a tree. He spent 10 days in jail. Neutral: Have you ever purchased a car in December? Know anyone who has? Have you ever had a December to remember?